Burne-Jones’ ‘Love Song,’ dated from 1868 will be the subject of a lecture by Prof Robert Baldwin at Essex Library. ESSEX — Following the Romantics, the Pre-Raphaelite Brotherhood took up four thematic arenas which were newly spiritualized since 1790: 1) the late Medieval Catholic past which the Pre-Raphaelites elevated to the highest level, 2) Woman as a refined, emotionally and spiritually intelligent object of male devotion, 3) an unsullied, pre-industrial Nature usually shown as a refined garden, a pastoral meadow, or a lush forest, and 4) the Arts themselves, especially music, poetry, painting, and architecture. 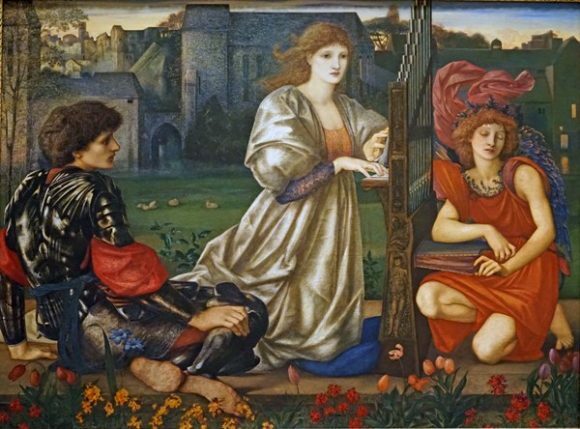 On Monday, Jan. 8, 2018 at 7 p.m. at the Essex Library, Associate Professor of Art History, Robert Baldwin, will explore Burne-Jones’ painting, Le Chant d’Amour, as it combines all four arenas in a particularly rich composition. Historically, it returned to an imaginary chivalry where “true love” existed far from mercenary London with its modern marriages of convenience. In its gender configuration, it placed a pure, glowing, aristocratic woman on an artistic pedestal against a distant cathedral and flanked by two male worshippers. As a landscape, it removed itself from the ugliness of modern London into a twilight arcadia combining a garden and a pastoral meadow. And aesthetically, it featured music, the art form universally hailed in the nineteenth century as more spiritual, universal, and emotionally charged. This illustrated lecture is free and open to the public. For more information or to register, call the Essex Library at (860) 767-1560. The Essex Library is located at 33 West Ave. in Essex.